Many things change in a dynamic environment, and this is also true for the crypto industry, which in 2018 experienced another 180-degree change of sentiment. This change affected everything and everyone, but its most important impact was as a cleanser. 2017 ended with a lot of hype, luring many people into the industry just to make a quick buck. Of course, this also brought in a good chunk of capital, but in the end, you can’t have the right focus if most of the players are only involved to make money as fast as they can. Looking at the industry today, we are precisely at this point: defining a new focus on exploring and creating new opportunities that will lead to a new phase of blockchain and crypto adoption. ICONOMI is no different in this regard. We more or less achieved the goals we laid out in our 2018 roadmap, and now we have a new focus — bringing more users to the platform. We will also reorganize to prepare our company for potential partnerships or another round of investment. We are replacing our tokens with security tokens (almost 80% of ICN holders took action) and preparing for the coming convergence of the crypto and financial industries. This convergence will take some time, since regulation frameworks will not catch up immediately. In the meantime, we will witness new crypto-related products and services. In Q4, our book value decreased from $96.2M to $37.2M, mainly due to falling market prices and impairments we made. In this report, we take last year’s crypto correction into account for non-listed assets. We impaired these assets by 80%. We also impaired the ether locked in a Parity multi-sig wallet; we have removed this ether from the balance sheet for a more accurate representation. 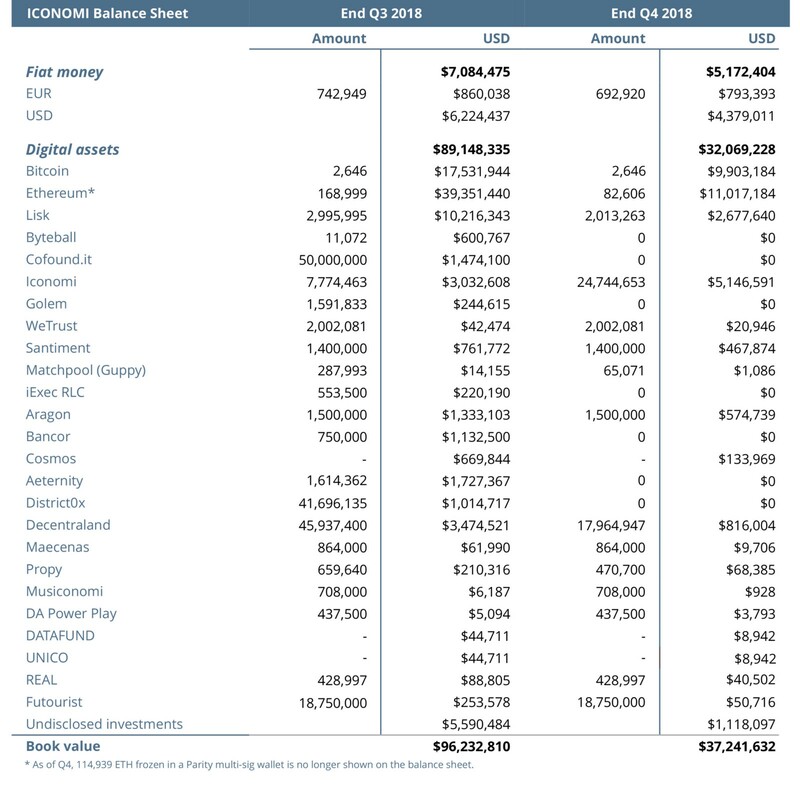 If ICONOMI is later able to access this ether, we will include it in the balance sheet again. Looking at our transaction activity, we decreased our positions in Lisk, Byteball, Cofound.it, Golem, Matchpool, iExec RLC, Bancor, Cosmos, Aeternity, District0x, Decentraland, and Propy, while we increased our positions in Ethereum and Iconomi. Expenditures were higher in Q4, mainly due to higher salaries and services. The main expenditures still came from salary costs; we now have a team of 44. Our revenues increased in Q4. Besides fees collected on the platform, we also got some revenue from staking some of our crypto assets. In 2019, new stories will be written, and we believe ICONOMI is well prepared to address all new challenges. In addition to our main focus on user growth and our role in the mass adoption of crypto, we will explore new markets. At the company level, our focus will be on STO issuance (prospectus, listing process). This process will also require some organizational and communication changes (such as revamping our blog and opening a dedicated investor channel). As for platform development, we have some surprises in store for this year, and we’ll share more in the coming months. or log into our platform to explore Digital Portfolios and individual cryptocurrencies.